Kathleen Jamie on how the Yup’ik people are re-learning to appreciate and respect their own culture. Quinhagak is a village on the west coast of Alaska, where the Quanirtuuq river unbraids and enters the Bering Sea. I’ve been here 2 weeks and it’s starting to feel familiar. There’s something almost Hebridean about it, with the fishing boats drawn up and the fish-drying sheds – though the inland landscape is vast and the Bering Sea surprisingly shallow and calm. It’s a cheerful town, though it looks like a midden until you learn what’s what. Telegraph wires tilt over the streets at crazy angles The houses are prefabs, raised up on stilts so they don’t melt the permafrost beneath. Around every house are 4-wheelers, snow machines, oildrums, puppy dogs, plastic pails, kid’s bikes, outcrops of tundra plants. If a vehicle or shipping container makes it here, it stays – there’s nowhere else for it to go. There are no roads to anywhere. The nearest sizeable town, with stores and a hospital, is a 40 minute flight away across the tundra. Big stuff, like houses and vehicles, arrive by barge in summer. Somehow the mess doesn’t matter, at least at this time of year because days are still long, the sky is vast, the tundra goes on for thirty flat miles before the first rolling hills. The bird-life is wonderful. Out on the tundra are sandhill cranes and cackling geese, stopping off on their way south. Harriers and little redpolls. The people here are Yup’ik. They don’t mind the word “Eskimo”, and use it themselves, but it’s polite to distinguish between the Yup’ik here and the Inupiaq farther north. Serving the village of 800 souls is a grocery store where you can buy Coco-Pops and cocoanuts, but not alcohol. This is a dry village which may account for its success. There’s a hardware store which sells rifles and spare tyres for the quad-bikes which everyone uses to scoot along the gravel roads around town. The most people I’ve seen on one quad bike is 7, including a new baby in a shawl. Despite the Coco-Pops, the people still live largely off the land. Right now, it’s salmon fishing and berry-picking season. The Coho salmon are running well. but a mild winter means the berries are poor this year. Soon the moose-hunting season will begin. In recent years, part of the seasonal round in Quinahag has been an influx of white folks In August. This year I am one. 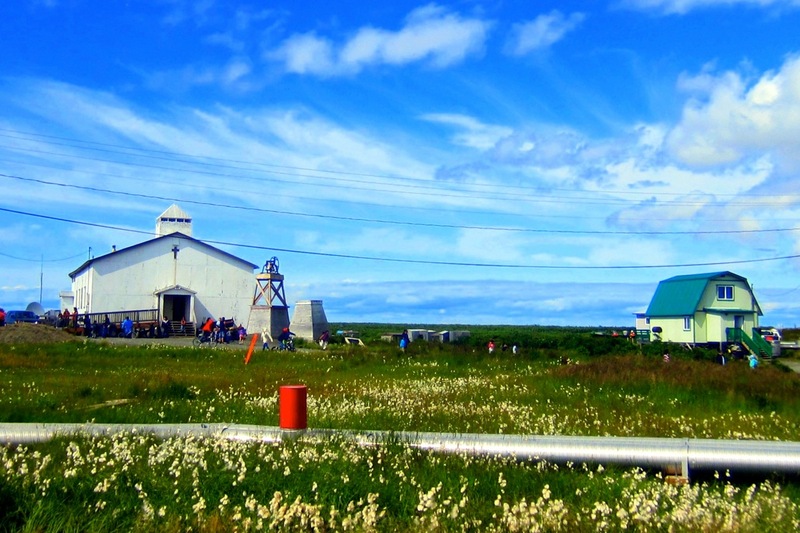 Aberdeen University is conducting an archaeological dig here which has grown from small beginnings to a major and important event not only for the village but for the whole of Yup’ik culture. Under director Rick Knecht, they are excavating a 500 year old village, abandoned and preserved in permafrost. The site is two miles along the coast from the modern village, right on the edge of the beach. Because sea levels are rising, much of it has already been swept away. Therefore the race is on to save the rest, because the site holds the largest collection of pre-contact Yup’ik artifacts ever discovered. Every day new objects are disinterred after 500 years below ground, which show how Yup’ik people lived then. Carvings and kayak parts, bentwood bowls and gaming pieces, ear-rings and dance-masks. A small tribe of student diggers comes to work, sometimes in horrible conditions, and in the evenings a team of helpers clean off the day’s finds with toothbrushes. We clean harpoon heads and dolls and uluks – women’s knives. We are headquartered in the town’s community centre. Interested folk stop by to see what’s been found. They marvel softly – ‘They were clever folks then!’ ‘How’d they make that, with no metal tools?’ Then they start telling stories about the old days, which were not so long ago. It took a little persuading, apparently, before the village corporation agreed to assist the archaeologists. But they were won over. ‘How else are we going to teach the youngsters their own culture?’ said village president Warren Jones. Pre-contact culture, he means, before the Yup’ik suffered the attentions of first, Russian traders and then, Moravian missionaries, and now, the seductions of the ‘lower 48′ – the rest of the USA. “Tell ’em we don’t live in igloos!’ he said. Then he was thoughtful, and then in the slow and measured way of speaking all Yup’ik people seem to share, he says that the elders were hesitant at first, the village council had to be persuaded to invest in and encourage the dig, to provide accommodation and transport. Warren argued it was for the future – and now the youngsters see their own culture emerging again, out of the ice. Right now, the last days of August, as the tundra takes on its autumn colours the digging season is drawing to a close. Soon the land will freeze again. We are preparing for the grand ‘Show and Tell’, an open afternoon when townspeople are invited to see the artifacts. And schoolchildren. We took a few artifacts into the school just a days after they came out the ground, to do a creative writing class. In English, admittedly, not in Yup’ik. We took a seal-shaped amulet, a net-weight shaped like a fish, a carved doll. The kids’ stories are to be displayed too, at the Show and Tell. The first year this event happened, 40 people came. Last year, 80. This year TV crews are expected to fly in from Anchorage, reporters, ethnographers. After that finale the dig will wrap up and all the artifacts and samples be sent to Aberdeen for conserving and cataloging. And in a couple of years, the real test will begin: the great homecoming, when everything will be brought back here to Quinahag where it belongs. Plans are developing and funding being sought to build a cultural centre, there will be a need for curators, education workers. It’s about cultural resilience. Confidence and renewal and taking your fate into your own hands. Weathering the bad times and rediscovering shared values. Coming out of times of shame (‘devil worship’ indeed) into times of resurgence and renewal. These Yup’ik people have been here thousands of years, hunting and gathering. Of course, they own their own land now – I envy them that, everything derives from that fact. The profits from their Native-owned resources are ploughed back into Native-owned services. They have weathered many storms, literal and metaphorical. You can’t help but feel, walking round the ramshackle-looking village, with its cheerful folks, that whatever life throws at them, they’ll be here a long while yet. Wonderful to feel our ‘present’, as we research, learn and share what we find for our ‘future’ – gle bhath! (very good!). How can they be re-claiming their culture if it is being all done in English. What a strange way to look at a culture without its language being at the centre of it all. English is the mother tongue of liberal values and progress….so we are told. The cultural spread of the language, particularly in eastern Europe, as a counter to Russian influence is significant. The tyranny of English, or ought we to call it by its authentic name American, is that it comes heavily armed, often literally, with rightist values. A quick scan of ex-soviet states where it is promoted reveals leaders in awe of the American worldview including an affection for Nato and its global aspirations. They are also markedly politically unstable or troubled by neo-fascism. I disagree with Finlay – sorry! Nothing is the same forever but a sense of inner value can be recovered. You can find the essence without the pain of a perfect time freeze. A connection to people for example as opposed to the isolation of a London type sterility. I’m rambling so I’ll shut up. Finlay, here’s an account from a Scottish artist’s visit to Alaska with pictures from schools showing language use. A beautifully written and heart-warming article. Thanks for that. Its relevance for Scotland at this time – actually globally – ought to be very clear. The language issue is a distraction. My wife and I just spent a week with friends in Switzerland. The husband is Swiss, the wife originally from Kyrgystan. The two sons aged 10 and 7 can already communicate in 5 languages. Would it have been better for them to be restricted to one – and which would it have been? They are immeasurably richer from having been exposed to multiple languages. We can’t – and shouldn’t – wish English away as a unifying force in the world (not to forget its almost unique treasury of philosophy, science and literature). Language should not be about separateness.